Brady Violations and . . .
Just before the state rested its case, Vinny received a late night phone call from the prosecutor--or as Minnesota hockey fans know him, Coach Reilly from "The Mighty Ducks." The prosecutor informed Vinny that he has just obtained some new evidence that he will present at trial tomorrow. 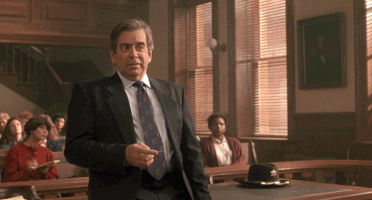 When Vinny contests that he has not been given notice or an opportunity to view the evidence, the prosecutor tells Vinny "I just got the evidence myself," and the judge will have to let it in. This is where a parallel can be made with the response we received after our most recent post. And, for the record, the prosecutor was right; the judge let the evidence in over Vinny's "lucid, intelligent, well-thought-out objection." Since Monday, Prosecutors have reached out to us and informed us that, while they do not disclose the measurement uncertainty in DWI cases, they have never been given that information from the BCA, so they couldn't disclose it even if they wanted to. However, this does not absolve prosecutors' obligation to provide and discover this information. In Kyles v. Whitley, the United States Supreme Court looked at a potential Brady violation and stated that prosecutors' obligation extends to any information known to "others acting on the government's behalf in the case." This obviously includes police and any person or entity that aids the state in obtaining evidence. In DWI cases, the Minnesota BCA is absolutely working on the government's behalf. They provide and maintain the DMT testing machines, certify the correct operation of the DMTs, train officers on how to operate the DMTs, and defend the test results in court. Simply put, without the Minnesota BCA, the state would not be able to convict anyone for driving with an alcohol concentration of .08 or more. Because the BCA works hand-in-hand with the state on DWI cases, any defense-favorable evidence they possess must be given to the defendants. If they do not provide the information to the prosecutor, it is the prosecutor's obligation to seek it out. This includes measurement uncertainty which shows a .08, or even .09, test result does not mean the driver's alcohol concentration was actually .08 or more.